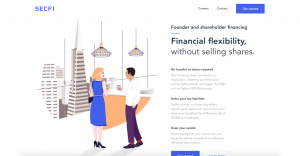 SecFi, a San Francisco, CA-based provider of financing to option holders and shareholders of late-stage private companies without them having to sell those shares, raised $1M in seed funding. The round was led by Social Leverage, FJLabs and CoVenture. The company intends to use the funds to accelerate growth and further evolve its products. Founded by Wouter Witvoet, SecFi is building products for employees pre-wealth so they can take advantage of their financial opportunities. They do this by providing financing to employees of growth and late-stage private companies so they can exercise their stock options and to the shareholders who already own their stock. The key to their offering is that all financing comes without risk to the borrower – if the company goes under, there is no legal obligation on the borrower to pay anything back. In return, borrowers pay a compounding interest rate and share a portion of their equity when the company has a liquidity event.